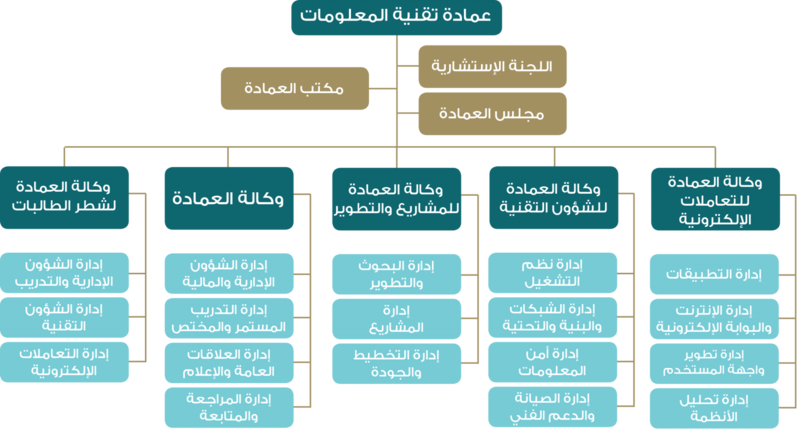 The Organizational Structure of Information Technology Deanship was set up to ensure achieving its strategic plan objectives. This structure consists of a group of administrative, technical and financial departments that are directly linked to the dean, and work under his direct supervision. Receiving transactions and letters sent to the dean and explaining them according to the instructions and regulations. Preparing letters, circulars, administrative decisions and announcements according to the dean’s directives and instructions. Organizing and archiving files, transactions and correspondence of the office to ensure its current and future use as well as to maintain the deanship's memory. Organizing the dean’s meetings, coordinating among members, issuing invitations and following up the preparation of the minutes of meetings and work sessions. Providing notes, suggestions and scenarios for the development of work methods in the Deanship in general and the Deanship Office in particular. Participating in temporary and permanent committees in the Deanship, as required. The Advisory Committee is composed of a group of advisors working under the dean's direct supervision. They prepare research, studies and consultations, in addition to lending support to the administrative, technical activities and work relating to the deanship's structures. Moreover, it is concerned with the preparation of proposals and recommendations on issues relevant to the deanship's activities, according to the future vision and are in harmony with the strategic and operational plans of the deanship and university. The Deanship Board is composed of its leadership; specifically its dean, all vice deans and whoever is seen, by the deanship, eligible to attend its sessions. The Board is concerned with taking decisions or approvals necessary for all the issues brought to its attention and related to the deanship's activities and work. Also, the Board takes part in putting together proposals, initiatives and recommendations to make the work of all departments more useful, and this is according to the future vision as well as the strategic and operational plans of the deanship and university.